South Korea Says It Plans To Reduce Guard Posts On The DMZ In what the defense ministry describes as a preliminary test, Seoul plans to scale back the posts in the spirit of the Koreas summit held in April. 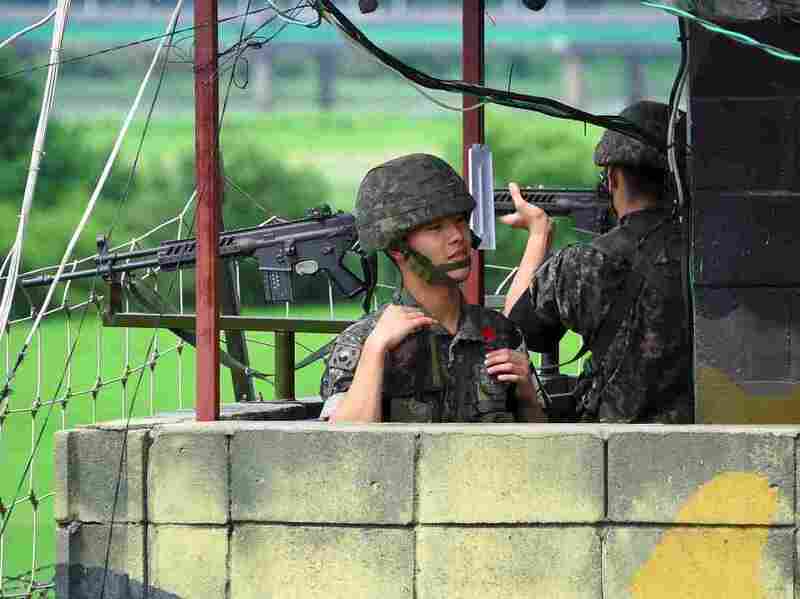 South Korean soldiers at a guard post near the Demilitarized Zone dividing the two Koreas in the border city of Paju in August of last year. In a report on Tuesday, South Korea's defense ministry apprised a parliamentary committee of its plans to reduce some guard post troops and equipment as a preliminary test of the agreement made at the Koreas summit in April and that it would consider expanding the effort to "transform the demilitarized zone into a peace zone," according to the Yonhap news agency. A spokesman for the ministry tells NPR that there is no timetable for the move and that it is only a proposal prepared for lawmakers. Last week, U.S. and South Korean officials held a fifth round of what Yonhap describes as "thorny defense-cost sharing talks" as part of the Special Measures Agreement, or SMA. Another round is scheduled in Seoul next month, Yonhap says. "The SMA talks are aimed at setting how much Seoul will pay for the stationing of the U.S. Forces Korea (USFK), currently totaling around 28,000. "Seoul is paying around 960 billion won ($850 million) this year under the latest five-year accord, a steep hike from 150 billion won in 1991, government data showed. ... The U.S. is pressing South Korea to pay far more, especially in the name of operational support costs, which includes the deployment of so-called strategic assets such as aircraft carrier, long-range bombers and nuclear subs to Korea." Meanwhile, Joseph S. Bermudez Jr., reporting on the 38 North website, says commercial satellite imagery taken on July 20 of the launch pad at North Korea's Sohae Satellite Launching Station "indicates that the North has begun dismantling key facilities. Most notably, these include the rail-mounted processing building — where space launch vehicles are prepared before moving them to the launch pad — and the nearby rocket engine test stand used to develop liquid-fuel engines for ballistic missiles and space launch vehicles." "Since these facilities are believed to have played an important role in the development of technologies for the North's intercontinental ballistic missile program, these efforts represent a significant confidence building measure on the part of North Korea," Bermudez writes on the website. However, as The Associated Press notes, "Other analysts say such steps wouldn't diminish North Korea's military capabilities or represent a genuine step toward denuclearization." Nam Gwan-pyo, a senior director from South Korea's presidential National Security Office, told journalists on Tuesday, referring to the 38 North report, "It is a better sign than nothing, and I believe [the North] is moving step by step toward denuclearization," according to Yonhap. The AP reports that North Korea's state-run media has also "toned down" its attacks on the U.S. and South Korea in recent days, although such attacks on Japan — which has taken a harder line on Pyongyang — have increased over the same period. In a tweet on Monday, Trump said he was "very happy" with the situation vis-à-vis North Korea following the June 12 summit, which he has hailed as a turning point in relations with the Pyongyang regime. "A Rocket has not been launched by North Korea in 9 months. Likewise, no Nuclear Tests. Japan is happy, all of Asia is happy. But the Fake News is saying, without ever asking me (always anonymous sources), that I am angry because it is not going fast enough. Wrong, very happy!"